Well the bad news had to come sooner or later. No the stand hasn't collapsed, but evil super-villainess Blossom Endrot has returned and she has returned with a vengeance. I thought I had vanquished this problem months ago. 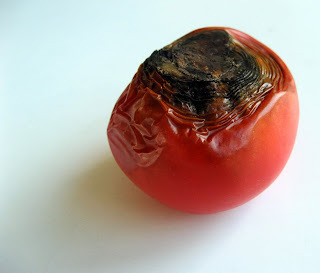 The tomato tree stand had been yielding good fruit and there were no signs of additional problems, then BAM, SOCKO, this weekend the end rot came back. I don't know why, I've been treating both pots the same way, and the "old-fashioned" approach doesn't exhibit any problems. 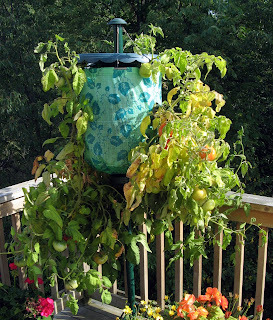 I am left to assume that tomatoes grown in the Topsy-Turvy Tomato Stand are somehow more susceptible to BER. The experiment with the upside-down approach is beginning to circle the drain. There is a palpable smell of death in the air. The good news is that the low-tech, old-fashioned approach is prodigiously producing laughably large fruit. Crabby won't go hungry for tomatoes, but he won't be eating as many as he'd planned. We'll cook again next time, I'm planning on posting a fish recipe, so those of you who get all flustered by fish, consider yourselves forewarned. You're not alone, though. The devastating Blossom Endrot has meandered meanly through my pumpkin patch as well this year. aaahhhh! I'm in charge of a friends garden right now (& not known for green fingers!! 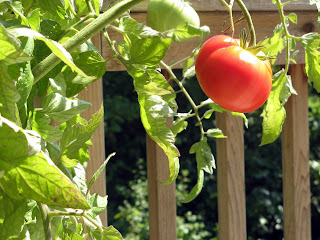 ), so far so good & I'm enjoying stealing a few cherry tomatoes. Too bad. Are you going to use it again next year?